As the digital landscape continues to evolve, online users are increasingly embracing visual storytelling. The inconvenient truth for many businesses is that handing over personal information in exchange for a boring whitepaper is no longer going to cut it. Maybe, its time to start thinking about upgrading your visual content. The speed of change is backed up by the fact that in 2017, 63% of businesses were using video as a marketing tool. 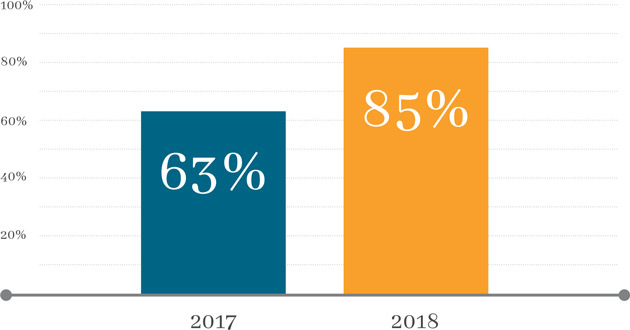 But, here in 2018, this has risen dramatically to 85%. Interestingly, brands are not just using visual content for promotional or marketing, but to educate their audience. It increasingly feels that time is becoming the new currency. In a digital age where we are bombarded with information across a myriad of devices, explainer videos, animations and infographics are a creative and effective method for businesses to broadcast valuable information in a short space of time. Capturing and holding the attention of a potential customer is notoriously difficult in a world of constant distraction. Businesses across multiple industries are all facing the same challenge of educating potential prospects about their unique value proposition and what problems they solve. The change in online behaviour represents a perfect opportunity for businesses to embrace explainer and testimonial videos. The ability to easily share them across social networks in a digestible format already make them an attractive option. However, it’s also critical to understand video marketing can also help you achieve both your short and long-term goals. Whether it be driving organic traffic or increasing conversion rates, there is no denying how visual content communicates information with your audience and broadcasts your message much faster than text. These are just a few reasons why quickthinking companies are turning to animation explainer videos. Simple, concise bite-sized videos that contain only crucial information are easy to outsource to experts who have the right tools and experience to bring your message to life. Not only are explainer videos concise, but they also allow you to present a problem and your solution side by side. But in a way that is creative and will also add personality to your brand. Digital marketing involves creating an emotional connection with your audience by helping to solve their problems and deliver value rather than being a pushy salesperson. It’s no longer enough to grab the attention of your audience, but you are now challenged for holding it beyond 10-20 seconds. But, where do you start? And why are online viewers so receptive to animation videos? According to research, people connect emotionally with animated content because it transports us back to our childhood. It taps into how we used to be much more receptive to incoming information when package in a fun and creative manner. This also the reason why 85% of users are more likely to buy a product after watching a video. Many businesses have avoided video because it is perceived as too complicated. A long list of requirements such as locations, willing volunteers comfortable in front of a camera and equipment are responsible for many projects failing to get off the ground. These are just a few reasons why quick-thinking companies are turning to animation explainer videos. Simple, concise bite-sized videos that contain only crucial information are easy to outsource to experts who have the right tools and experience to bring your message to life. Whereas traditional video formats are expensive, time-consuming to create and limiting, animation videos allow much more flexibility. For example, the voiceover can easily be modified for a variety of demographics or even cultures. Imagine having one compelling video where you could change the tone, accent or language to target to different audiences in your marketing campaigns. It is also easy to change animated characters or backgrounds on a video and help your message reach a much broader audience. As the speed of change continues at breakneck speed, traditional video can also date very quickly. Re-shooting scenes from a live-action video to update individual elements of your message is just not practical either. By contrast, animation once again has the edge. The flexibility to update your message or perform a complete overhaul of your entire video becomes relatively easy. Essentially, animation videos enable businesses to avoid the traditional constraints that have been preventing your business from embracing video in a mobile digital world. Animation offers a dynamic, creative and versatile way to highlight your value, simplify your message and make your business stand out from the crowd. Maybe, its time you stopped sitting on the fence and gave your audience, the fresh and informative web content they deserve before somebody else does. Have you ever asked the question, how do I create an animated explainer video? If you have, we would love to share examples of how animation videos can bring your message, product or service to life across multiple channels. Are you sick of hearing about GDPR?